Summary. January 1970 found W3 Coy a much changed sub-unit; the nervousness of the earlier operations was gone, the soldiers felt more settled in their abilities and procedures and some personnel had been moved to new roles or had a redistribution of equipment to better adjust to the realities of the theatre and the operational tempo. By the end of the month the soldiers had lifted their game to a higher and more professional level but suffered their first casualties. W3 celebrated Christmas and New Year on the same day, having not finished Op BLUEWATER until today. There was a celebratory meal with turkey and trimmings followed by a stand-down period within Nui Dat. RSM 6RAR/NZ trained all CSM at the HORSESHOE range on the new US M67 hand grenade as preparation for the CSM's then conducting Coy training. The new ball shaped and more bulky M67 grenade [picture right] was replacing the slimmer oval shaped M26 HE grenade [picture left] but both models of grenade were available and used during the remainder of the tour. No record of Company activities for the period 3 - 6 January could be found. On 6 Jan 70 Pte Tom Cooper 3Pl suffered an injury to a hand when testing claymore leads, the incident was officially investigated [it is likely a firing device tester was faulty, or Tom was incorrectly holding a detonator which was faulty]. W3 Coy is likely to have conducted occasional overnight TAOR patrols but the official record does not identify sub-units involved ['Sub-Unit to provide: TBA' for all serials of the patrol table]. 6RAR/NZ appears to have had a relaxed in-base programme as the following items show, although planning and preparations for Op NAPIER were being managed concurrently. Lt Col Butler was absent on leave from 3 - 11 Jan 70 and in his absence 6RAR/NZ was commanded by the New Zealand 2ic Maj Neville Wallace. On 26 Jan 70 a routine order advised that the Mortar Pl commander Capt JE Horan RAR was appointed wines member for the 6RAR/NZ (ANZAC) Bn Officers Mess Committee. The W3 mortar section departed on 5 Jan on AMC with 2Tp B Sqn 3Cav for a 4-day independent operation in the XUYEN MOC area operating with local ARVN RF troops. The operation concluded 9 Jan in time for Op NAPIER, detail is at this link. W Coy conducted grenade training on the new US M67 hand grenade at the HORSESHOE range. Vehicles moved groups of soldiers to the range and back to Nui Dat as required by Coy HQ. An inter-company marathon relay was held between 0900H and 1000H. The course was 8Km around the Nui Dat perimeter [inside the wire]. It was thought necessary to issue orders prohibiting kicking, biting, eye gouging and punching. SSgt Lichtwark was placed on Checkpoint 6. There is no record of how the W Coy team fared. A tabloid sports tournament ‘open to both amateur and professional teams’ was held at LZ Eagle Farm starting at 1430H and concluding around 1630H. Teams contested 9 events including tug-of-war, wheelbarrow race, continuous cricket, and pole climbing [all competitors had to be human]. Rules were set by the Nui Dat Sporting Federation and umpires decisions were final. SSgt Lichtwark was one such umpire. There is no record of how the W Coy team fared. 6RAR adv party took over FSPB PEGGY YS434835 from 8RAR in preparation for starting Op NAPIER in the Courtney Rubber in northern Phuoc Tuy province 10 January until 9 March 1970. 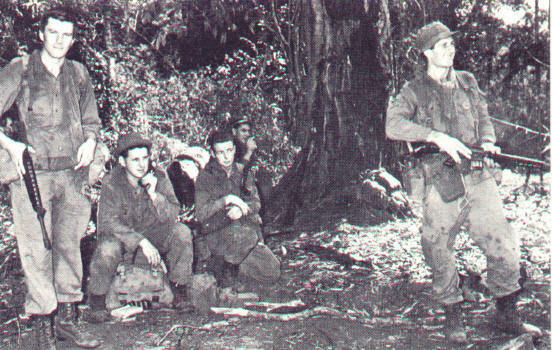 The first phase of the operation saw 6RAR/NZ conducting a cordon and search of the major settlement of Ap Ngai Giao [on Route 2 10 Km due north of NUI DAT and halfway between the Binh Ba and Courtney Rubber plantations] as part of the plan to seriously disrupt VC supply, maintenance and liaison routes east to the Nui Mao Tay area. Outline. 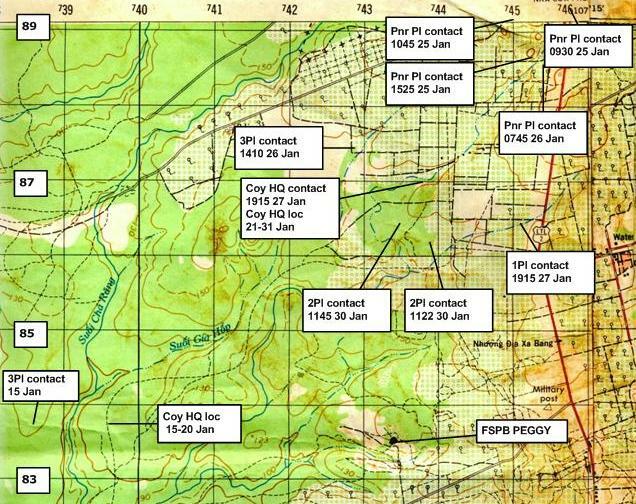 W Coy were tasked as part of the cordon, flying into FSPB PEGGY YS434835 before moving close in to the west of AP NGAI GIAO. The Company was to man the south west quadrant of the cordon later stretching north to replace D Coy platoons on the west and north sides [B and D Coy were to do the village search once the cordon was established]. The W Coy mortar section were mounted on AMC as part of the B Coy move in APC and then co-located with Bn Tac HQ at the SE corner of the cordon near the cage area. 1100H W Coy airlifted into PEGGY from where they patrolled as a column of platoons to the south to be nearer AP NGAI GIAO. During the day the Company approached AP NGAI GIAO in column from the west to be in position ready to establish the cordon. 1805H W Coy was in position as part of the cordon, SW corner of AP NGAI GIAO. A plan of the village drawn for the rifle company's benefit is here. 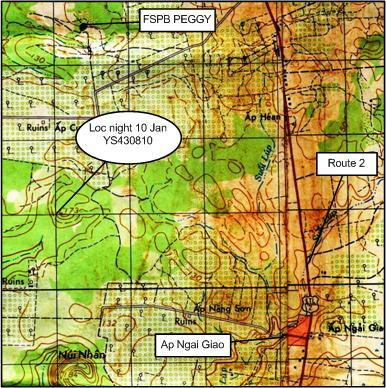 At 1830H [the time of the normal civilian night curfew] the 6RAR/NZ cordon around AP NGAI GIAO was in position, with W Coy from the southern Route 2 entrance [6 o'clock] left around the village to the 9 o'clock position, linking with D Coy to the north of 9 O'clock. From 1800H the 1ATF Psy Ops unit ground team were utilised to contact the village inhabitants with these directions. The troops were required to keep the village under observation while preventing any people outside from rejoining the village and people caught inside from escaping. V Coy made contact with the NGAI GIAO guerrilla squad during their movement toward the village to establish the cordon, killing two VC and wounding two others. Night location W Coy complete YS462791. 0700H W Coy spread north and took over D Coy cordon responsibilities YS462796. The holding cage pens [made with barbed wire coils] and tentage facilities for national police, Civil Affairs and Psy Ops use were constructed by the Aslt Pnr Pl at the SE corner of the village. At 0856H the security sweep through AP NGAI GIAO was commenced by B and D Coy, locating several detainees and a quantity of stored food. Once the sweep was completed villagers were systematically moved from their homes while these were searched, into and through the cage area where a number of VC sympathisers were arrested by Vietnamese police, other villagers being offered the gesture of Australian medical and dental assistance. The W3 mortar section in AMC was present with other APC in the cordon at the south entrance on Route 2 near the holding pens. 1525H the sweep concluded - nothing of significance was found and the cordon was withdrawn, company's moving into harbour locations slightly away from the village. W Coy night location complete YS460792, mortar section remained with Bn HQ Tac and near B Coy supporting APC troop. 0815H W Coy mounted APC and left AP NGAI GIAO for FSPB PEGGY, then moved west to start patrol operations. The AO assigned W Coy was not large and consisted largely of rubber plantation, some of which was being worked during the day by local villagers. Coy HQ had difficulty with communications and finally elected to operate from static locations to allow better aerials to be erected through the canopy. 1145H W3 mortar section left AP NGAI GIAO with B Coy on APC for NUI DAT to prepare for OP MATILDA in the HAM TAN area in the east of Phuoc Tuy province, arrived NUI DAT 1246H. Contact: 1045H at YS386838 3Pl [who were co-located with Coy HQ] were preparing an ambush position and had placed sentries out 30 metres each side of the killing area. The northern sentries observed 3 VC approaching along the track, the sentries fired a claymore when the lead VC was 10 metres away from the sentries and only one metre away from the mine and followed up with M16 rifle fire before withdrawing to the platoon perimeter. 6RAR/NZ unit diary reports 1x VC KIA, 1x VC WIA PW, 3x packs dumped on track but that one VC was carrying two packs. The after-action contact report says 2x VC KIA and 1x VC WIA PW located after a sweep along the blood trail for 300 metres. The after action report is always likely to be more accurate since it is written after all activities are concluded. There were numerous contacts with VC by other companies during the day. W3 mortar section in AMC accompanied B Coy on OP MATILDA, departed from NUI DAT to marry up with the A Sqn 1 Armd Regt [Centurion main battle tanks squadron]. Op MATILDA was the largest infantry/armoured operation conducted by Australian armoured forces since World War II [a separate timeline for Op MATILDA is on the mortar section webpage]. 1143H at YS393827 2Pl observed 8-10 VC crossing a stream, 1Sect followed but lost trail in vicinity YS388827 when VC party split up. It was likely the VC realised they were being tracked and split to confuse tracking. The Aslt Pnr Pl under Sgt A McLean 6RAR and including the W Coy section was placed under command of W Coy and deployed by Coy HQ on patrolling and ambush tasks in common with the other platoons. Contact: 1055H at YS453892 Pnr Pl contacted 1x VC who fled when challenged by the sentry. The patrol aggressively followed sign which led to a cache and a small village where an elder identified the location of two VC, one WIA from an earlier contact. Both VC were captured, but the Pnr Pl contact VC was not located. 1200H at YS450892 Pnr Pl located a rest stop for 5 persons, food and equipment recovered.. Contact: 1400H at YS450889 Pnr Pl searched a house where a local elder informed them of an armed but wounded VC hiding in scrub nearby. At 1432H they captured 2x VC [1x WIA] and detained a female suspect. The old man was also suspected as being VC and was held for interrogation, the PW's being identified as members of BA LONG forward supply council. All suspects were evacuated by helicopter. Contact: 1715H at YS450866 1Pl contacted 1x VC, VC survived. 1Pl had a clearing patrol scouting thick secondary growth with visibility no better than 25 metres while an ambush site was prepared. The lead scout glimpsed 30 metres away the face of a VC outlined against a dark background and could make out a green uniform. The scout and cover scout fired at the VC who fled back into the dense growth leaving some equipment and food scattered behind. The follow-up at 1726H established that 2x VC were at a well preparing a meal when contacted. Contact: 0840H at YS453889 Pnr Pl captured 2x VC, 2x packs and 1x AK47. One VC was from D3, 274 VC Regt, the other from K24 Dispensary 274 VC Regt. [no record of how PW were removed from scene]. Contact: 0930H at YS456893 Pnr Pl contacted 6x VC, 1x VC KIA, 1x VC WIA PW, and perhaps 1x VC WIA. The platoon was sweeping along a ridge when the lead section spotted the VC party. The patrol commander did an immediate contact front, extended in line and pressed a quick assault toward the VC party which confused the enemy party and they scattered without attempting to counter the attack. One VC who returned fire while attempting to withdraw was engaged and seen to fall. The VC KIA was later identified as Coy Comd Rear Service Coy 274 VC Regt. At 1010H at YS451889 the Pnr Pl located 1x VC body in grave believed to be that of the 1x VC WIA earlier, meaning total for contact 2x VC KIA and 1 VC WIA PW, PW DUSTOFF complete at 1027H. Contact: 1045H at YS450890 Pnr Pl contacted and killed 1x VC. The gun group was directed to higher ground to cover the remainder of the patrol while they cleared a LP. While moving the gunner trod on a VC lying in a small depression and covered by grass. The gunner threw himself to one side firing on and killing the VC. No other VC were found in a sweep. Documents on body identified the VC as a member of Rear Service Coy 274 VC Regt. Contact: 1525H at YS452883 Pnr Pl contacted 3 VC. 1x VC KIA. The platoon was part of a cordon on a village. The lead scout heard movement in a stream and without telling others went to investigate. Three VC were observed in the stream and warning shots were fired while they were called on to halt. The VC failed to heed the warning and one was shot. Another VC was not engaged when seen withdrawing, no further contact was made with the 3rd VC. 1635H at YS458900 2Pl received a VC HOI CHANH, sent to 1ATF. Contact: 0745H at YS454886 Pnr Pl contacted 2x VC, 1x VC KIA. A clearing patrol was inspecting a tree line above a stream when the sect 2ic saw movement of a banana tree and detected VC. He fired two shots hitting one VC. Contact: 1410H at YS428874 3Pl contacted 5 VC. 1x VC KIA, 1x VC WIA. The platoon was checking a streamline when the lead scout heard voices like children playing, looked over a small knoll and saw 5x VC sitting in a group playing cards. The VC sighted the patrol and started to scatter in different directions. The lead section commander rushed forward with his section in extended line and opened contact from 70 metres. Documents identify the party as being from CHAU DUC and BINH BA on a resupply task. Between 1300H and 1530H near the B6 post the Pnr Pl detained four women within 400 metres of each other. One women had 28,000 piaster in her possession. All four women were evacuated to 1ATF for interrogation. Contact: 1720H at YS427883 3Pl contacted 3x VC who were engaged at 150 metres by a sentry. 3Pl used artillery to cut off their escape and conducted a sweep but no VC were found. 1610H at YS444875 Pnr Pl detained 4 females. Contact: 1910H [after dark] at YS438870 Coy HQ contacted 3x VC, 2x VC KIA. The VC walked across the LZ and track that Coy HQ had kept under observation for five days prior. The sentries fired their claymores and engaged the VC party with M60, M16, SLR and M79 fi re. A helicopter had landed on the LZ 2-hours earlier. A sweep at first light revealed two VC KIA, they were identified as belonging to C21 (Sapper/Recce) 274 VC Regt. 1931H [after dark] at YS451865 1Pl initiated their ambush after trip flares close to the killing area were ignited. No VC were sighted but the area was engaged with claymore, M60 and other small arms fire. Artillery fire was also directed into the area. 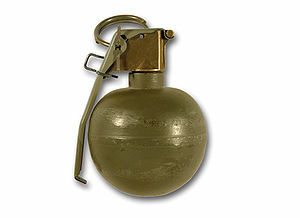 Two M67 HE grenades were thrown into an area to one side of the track under ambush, at least one bounced off vegetation and landed back close to the section in contact. Consequently four 1Pl soldiers were WIA with minor fragmentation wounds, they remained on duty overnight but were casevac'd the next day. The four WIA were Teller, Davie, Caldwell RA, Naughton. Given the lack of reaction from the VC party it could be assum ed that animals may have tripped the flares. A cautionary word quickly spread around the Company about the danger of throwing grenades in thick vegetation or after dark. 2000H [after dark] at YS451895 2Pl in ambush contacted 1x VC who survived. Contact: 1150H at YS448867 1Pl contacted 3x VC. 1x VC WIA [BT], 3 packs captured, group identified as from NGAI GIAO guerrillas. 1245H at YS441873 Pnr Pl while doing a cordon and search of a village detained an unidentified male later revealed to be VC. Contact: 0730H at YS443874 W Coy [element not identified] captured 1x VC who had been earlier WIA in contact on 28 at 1150H at YS448867, the site and time of the earlier 1Pl contact. The PW stated that 4x VC in his party of eight were KIA and one WIA in that contact. 1000H at YS431873 Pnr Pl located a bunker and well. 1645H at YS452884 3Pl with assistance from Vietnamese national police detained 1x VC female who was extracted to DUC THANH for interrogation. Contact: 1122H at YS438862 2Pl had two patrols about 200 metres away from the main ambush area. The lead scout of Cpl Goodman's patrol Pte Rex Ryan [right] contacted 2x VC moving through thick jungle, after a brief engagement at 30 metres distance both VC were WIA [BT] but fled the scene. Cpl Goodman's patrol tracked the VC by following the blood trail [BT] while the second patrol moved to block the VC withdrawal. 1730H Bn HQ 6RAR advised Rear Details Nui Dat of a requirement for all personnel in rear areas to be issued with respirators [what..! in case of a biological or chemical attack..? ], no explanation is found. 1430H at YS442869 W Coy HQ reported an explosion in the area of a scrub fire. Investigation revealed a crater in old APC tracks believed to be caused by a 20-30 Lb ATk mine which had been in the ground for up to 2-years. Contact: 1945H at YS442878 3Pl contacted an unknown number of enemy with no result.